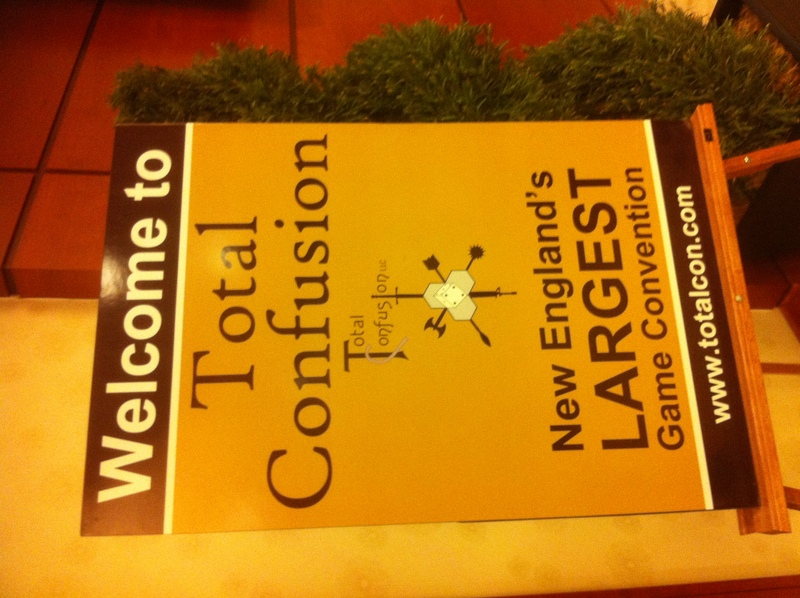 Last weekend I was able to attend TotalCon XXVI – New England’s largest gaming convention. I had originally only planned to attend only Saturday & Sunday and then at the last minute decided to make a four day weekend out of the convention. Boy was I glad I did as I had a fantastic weekend. I broke the weekend up into a few posts to make it easier to read. Enjoy part 1! I arrived Thursday around noon, headed to registration and picked up my badge.Then I found Angela and received our table assignment for the Sages of RPG table. 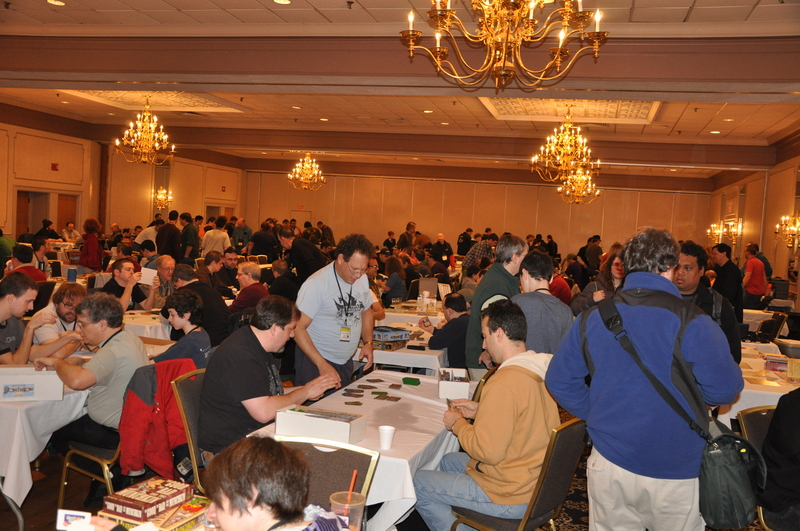 Once everything was settled in I decided to scope out the board game room. 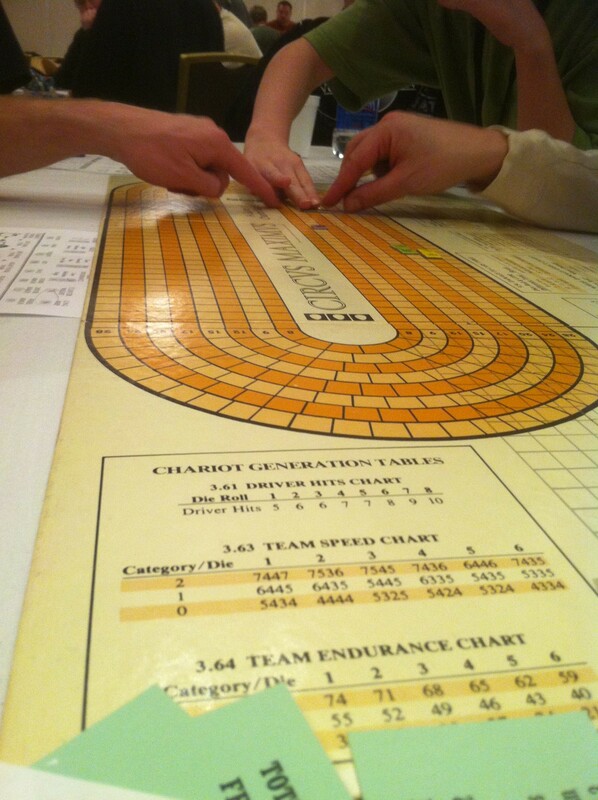 In the board game room there was a projector that had a list of games and starting times. I saw a game of “Werewolves of Millers Hollow” was starting soon, so I found the table and sat down. The GM showed up and we chatted a bit so I could learn all the different roles the game had. Sadly though not enough players were around to fill the game. However, all was not lost because the group decided to pick a game from the game library and play. We chose Eminent Domain, and even though none of us had played before we picked it up quickly and I really enjoyed the game. After finishing up Eminent Domain I taught and played an enjoyable game of Small World with some teens that were searching for something to play. Next, I sat down and learned the card game Alhambra. Alhambra was on my list of games to try at the con, so I was happy to get a chance to learn and play. I really liked the game and found it to be simple yet complex. You collect cards and use them to purchase tiles that you combine to create a “Carcassone” like city in front of you. My dad and I went out to a nearby Wendy’s for dinner then it was back to TotalCon for Circus Maximus. I saw this game played last year on the stage with LEGO chariots and wanted to give it a try so I sat in on the training session with a dad and his two kids. In Circus Maximus each player is a chariot racer and gets to decide what type of chariot they drive, how fast their team of horses is, what weapons they will use, as well as some armor and tactical items. You race around the track while ramming into each other, stabbing other players, and generally trying to wreck havoc with your opponents chariots. I really enjoyed the demo and was happy to get to play it. After Circus Maximus it was time for bed so I headed in for the night. We traveled in from our room at the closely located Red Roof Inn back to the convention hotel for their decent breakfast buffet. 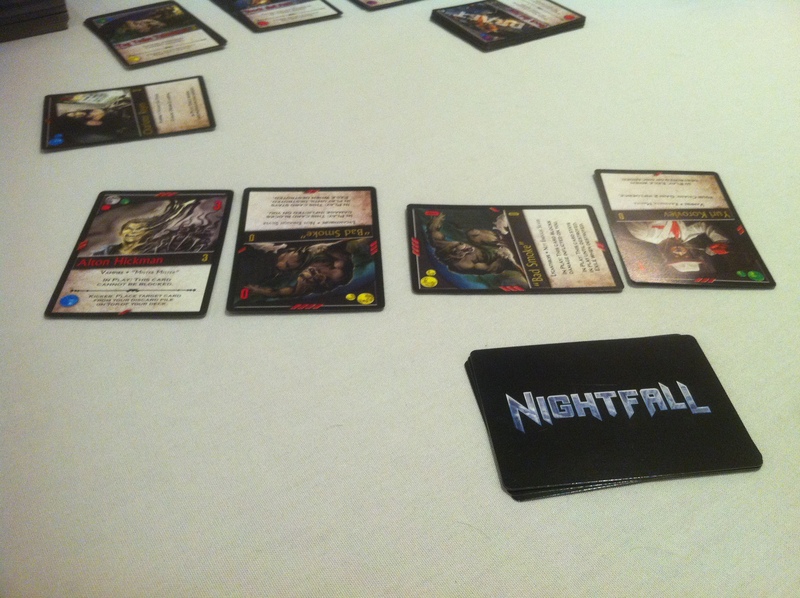 Then I headed into the board game room and found the “Learn to play Nightfall” table. Nightfall is a unique deck builder from Alderac Entertainment Group. Players are dark overlords commanding minions that they use to inflict Wounds on other players. The game has some interesting mechanics and was pretty easy to pickup once we got going. It was helpful that our teacher knew the game really well and taught it clearly. I ended up getting slammed in the last few turns with wounds, but it was an fun experience none the less. After Nightfall the day was pretty open so I just headed over to the board game area and found a game that needed players. The game that piqued my interest was Yspahan (good luck pronouncing it). In this game one player rolls dice and then places them on an action board. From there players pick their actions in turn. Actions range from recruiting camels to save your people from being sent to the caravan, to placing people on the board to control certain districts for points. There is also a supervisor running about town that players can move to force people into the caravan. You can also use resources to build building for extra points and benefits. I liked the game and would like to play it some more to get the strategy down. When Yspahan was done I headed over to see what other games I could hop into and there was a game of Kingsburg with expansions starting up. I really enjoy the base game of Kingsburg so I figured I would give the expansions a try. There were four players in the game and we decided to play with one part of the expansion; role cards. These role cards added a little bit to the game, but nothing spectacular in my mind. The game was enjoyable as always. The group that played Kingsburg was up for another game so we broke out Kingdom Builder. I had not heard anything about this one but it was a fun little game that has tons of random setup. There are variable map tiles, variable scoring conditions, and variable special locations. I like game with randomized setup because it makes each play experience different. 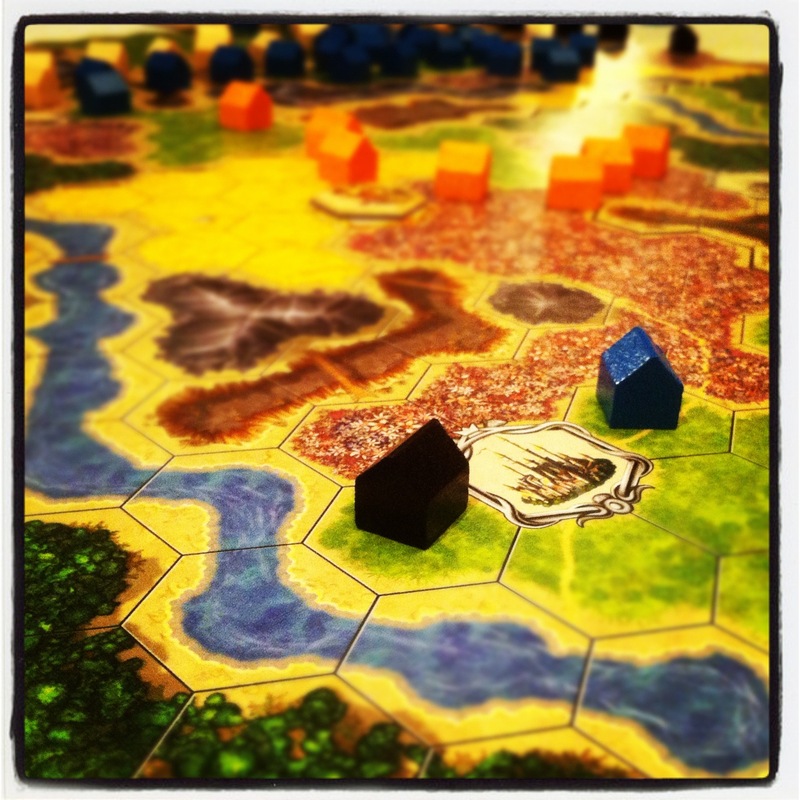 The basics of the game are that you strategically place you houses on the board in order to satisfy the scoring conditions, as well as gain control and use of one of the special locations. The game was quite fun and I have put it on my list to pick up. The last game with this group of players was a short “Thieves Dice” prototype that one of the players is working on. It’s a light filler with player interaction. The game was pretty interesting and showed some promise. I hope to see more of it in the future. After a day in the board game room it was finally time for the main event of Friday for me. The Cube of Death tournament. I will be writing up a complete blog post about this event soon as its more than I can cover in a paragraph, but here are the basics. 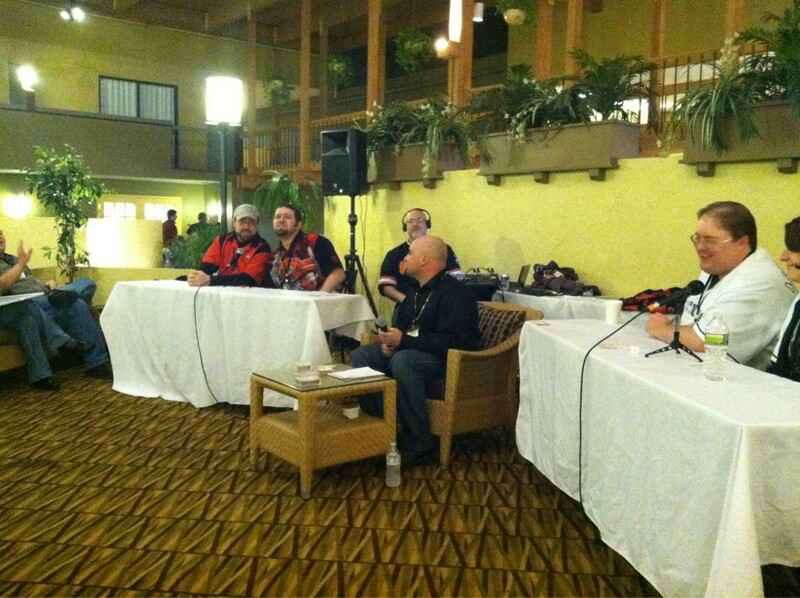 Teams of two each with 30 life face off against each other in a trivia game. When a team gets a question correct they deal 1d6 worth of damage to the other team. The event was really enjoyable and I had a great time even though I knew hardly any of the questions, but my random partner from the con, Chris Pierce knew 98% of them 🙂 so we ended up winning in the end. In between rounds of Cube of Death I was able to sit-down and play a few short games with Ben Gerber (Trollitc), Ben’s wife Jenn, and Jonathan Reinhart (CWF Podcast). We started out with a quick game of Poo: The Card Game where you play monkeys flinging poo at each other, when you get 15 poo on you you’re out! A silly little game, but really enjoyable. 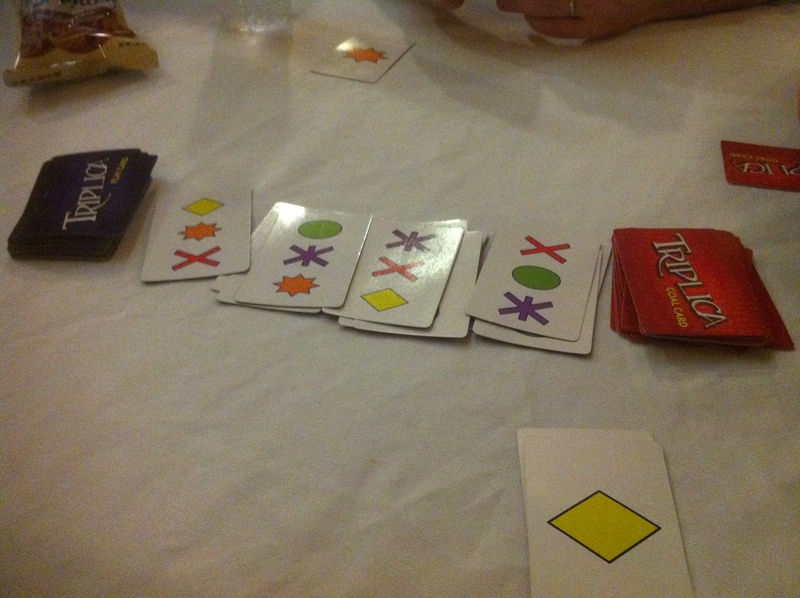 Then we played a quick round of Triplica, a nice little three in a row card game that I love. Then we played a round of Timeline on the iPad, a game where you place your cars in their correct place chronologically on a timeline. Ben whipped Jonathan and I at this one. Please take a look at the following lists. These are links to purchase the games on Amazon.com if you can’t find them at your favorite local game store. Also there is a Geeklist up on BoardGameGeek! Thursday Games: Eminent Domain, Small World, Alhambra, Crokinole, Circus Maximus. Friday Games: Yspahan, Poo: The Card Game, Timeline: Inventions, Triplica, Anomia, Nightfall, Kingsburg, Kingdom Builder, Cube of Death.